Clearly Summer has left the UK before it even began to settle in. Already I'm digging out my boots and chunky knits, ready for the cold wind and rain that is slowly arriving. Alongside changing up my wardrobe, I also adjust my skincare routine. I find that during the Winter, I get a lot of patches of dry skin on my cheeks and my eczema flares up really badly. And don't forget the chapped, cracked lips and dry hands! I've put together a little list of products that I will be using throughout the next few months to keep the Winter skin at bay! L'occitane Honey Shea Butter - A handy little tub that I keep on my desk. I massage this into my nails and cuticles to keep them hydrated. EOS Lipbalm - My Holy Grail lip balm. Seriously, this is better than Carmex! Lanolips Lip Ointment - My other HG lip balm. Just as good as the EOS and it's a lot easier to carry around in my bag. 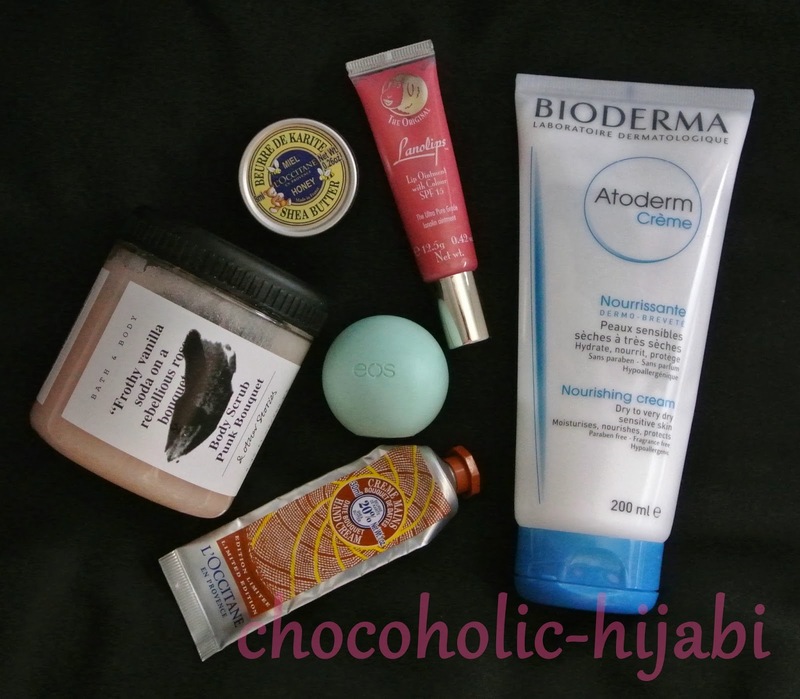 Bioderma Atoderm Nourishing Cream - This Bioderma cream is helping keep my eczema and dry skin at bay. Ever since I've come back from holiday, the eczema around my eyes has disappeared (I think it's something to do with the warmer climate), and I'm just using this around my ears and my arms and legs, as I seem to always be getting told that I have very dry skin. L'occitane Shea Butter Hand Cream - I have back-ups of this hand cream. This is another HG product and I use it all the time. The Shea Butter in the hand cream helps keep my hands moisturised and nourished so I'm not constantly applying hand cream. Do you change up your skincare for Autumn and Winter?